Worship at First Baptist Church is characterized by strong conservative Bible-centered preaching and blended evangelical music as we together seek to honor and worship the Triune God in all His glory and majesty. Come join us each week at 9:15 a.m. for Sunday School and at 10:30 a.m. for our classic worship service on Sunday in our sanctuary. 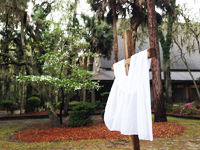 Revitalize your spirit at one of Hilton Head Island’s houses of worship. Serving all denominations, our churches and synagogues provide an uplifting atmosphere where you can practice your faith. Our warm and friendly congregations will welcome you with open arms.